TORONTO, ONTARIO, August 8, 2018: Cordoba Minerals Corp. (TSX-V:CDB; OTCQX:CDBMF) (“Cordoba” or the “Company”) today provided an update on recent activities at its 100%-owned San Matias Copper-Gold Project in Colombia. 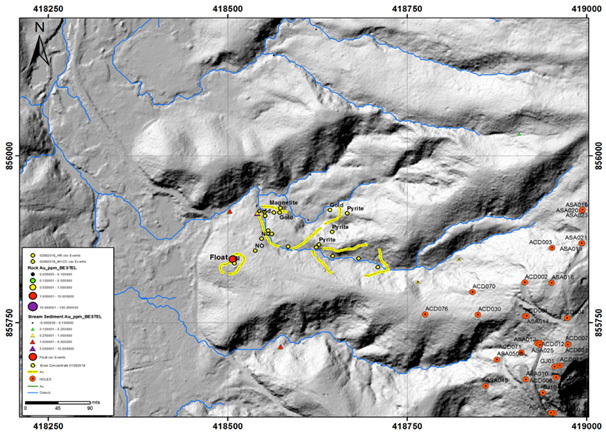 Detailed project work comprising “boots on the ground” on a district-scale across the northwestern-end of the San Matias Project, re-logging of Alacran drill core, and analysis of trace element zoning patterns has outlined two previously unexplored areas that are hypothesized to be potential sources of mineralizing fluids. One possible centre of mineralization is related to a massive body of mineralized breccia exposed at the centre of the current artisanal hard rock mining pit, which is at the edge of the Alacran town. Ninety metres below the pit floor ACD036 encountered 4,440 g/t gold, 10.25% copper, 24.7% zinc and 347 g/t silver over 0.9 metres in an overall intercept of 136.0 metres grading 1.00% copper and 0.56 g/t gold (all assays used for intercept calculations were capped at 10% copper, 10 g/t gold, 10% copper equivalent; previously reported on January 23, 2017). Re-logging of the surrounding Alacran drill core identified dikes, quartz veining and breccias that are believed to be related to the breccia body, which dip to the west into a covered area west of Alacran town. These structures may provide a vector to aid in exploration of this area. Approximately 270 metres beneath the Alacran Deposit is a low-angle fault that truncates mineralization. Matching of dikes across the fault suggests Alacran mineralization has been displaced up and to the east away from a postulated source of breccia bodies, dikes and veins. 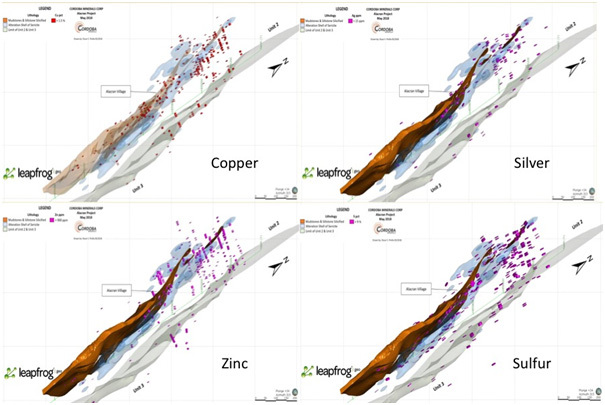 Analysis of Alacran drill data has outlined internal metal zoning patterns within the deposit that show an increase in copper, silver, zinc and sulphur values toward the north. These are the same elements encountered by the ACD036 intercept. Following the direction of increasing values to the north beyond the limit of Alacran drilling, historical soil sampling data has outlined an area of 2.5 x 3 km with anomalous silver values. In the Montiel area, west-northwest-trending structures, pyrite-chalcopyrite veins and shallow-dipping quartz veins trend westerly toward the area of anomalous silver soil values described in the previous bullet. The anomaly, named “Way Out West” for its location relative to Montiel, appears to coincide with the intersection of the projected Montiel structures and the projected northerly trend of increasing metal values at Alacran. The “Way Out West” anomaly is at the intersection of two significant geological trends, which has led Cordoba’s geologists to hypothesize that this area could represent another source of mineralizing fluids in the San Matias District. Current exploration is focused on re-logging Alacran drill core to outline breccia bodies, dikes and veining to define drilling targets west of Alacran based on fault offsets across the low-angle fault that underlies the area. Cordoba’s geologists also are looking at trace element zoning patterns in combination with geology, alteration and structural data. Significant gold in streams has been identified west of Alacran in the area of interest. In addition, at the “Way Out West” anomaly, panning of stream sediments combined with soil sampling of saprock and BLEG (Bulk Leach Extractable Gold) sampling are being used to further explore anomalous drainages. This work has returned encouraging results that will be used to define drilling targets to test for another source of mineralizing fluids. Cordoba’s geologists have been focused on regional fieldwork at San Matias to explore for new mineralized zones and to extend areas of known mineralization. This work has included stream sediment sampling, soil sampling and trenching at a number of prospective targets throughout the San Matias District. Figure 1: Cordoba’s geologists active in the field at San Matias. Detailed mapping in the centre of the current artisanal hard rock mining at the edge of the town of Alacran discovered a massive body of mineralized breccia. This breccia was previously unexplored by drilling due to a lack of access. Re-logging of the surrounding drill holes indicates the presence of breccia, porphyry dikes and shearing that cross-cut sericitized and albitized host rock that contains disseminated and veinlet-controlled chalcopyrite-pyrite mineralization. Faults, dikes and breccia bodies appear to disrupt the interbedded carbonate sequence that hosts the manto replacement mineralization, which has resulted in doubling the thickness of the mineralized sequence. A low-angle fault truncates the mineralized Alacran sedimentary sequence up to several hundred metres below surface. This is based on the observation that the Alacran mineralization is offset to the west by low-angle faulting; therefore, the Montiel area may also be controlled by a similar offset as it exhibits bottoming of mineralization. Figure 2: Schematic conceptualizing gold copper mineralized breccia in relation to Alacran carbonates package. Figure 3: Polymetallic breccia mineralization in the Alacran Deposit. Figure 4: Significant gold mineralization identified in stream sediments located west of previous Alacran drilling. Figure 5: Surface grab samples with boxwork structures collected from just west of Alacran. Cordoba’s geologists have conducted a detailed analysis of existing Alacran drilling data to discern trace element geochemical patterns. Internal metal zoning within the known manto replacement body shows an increase in copper, silver, zinc and sulphur values to the north. 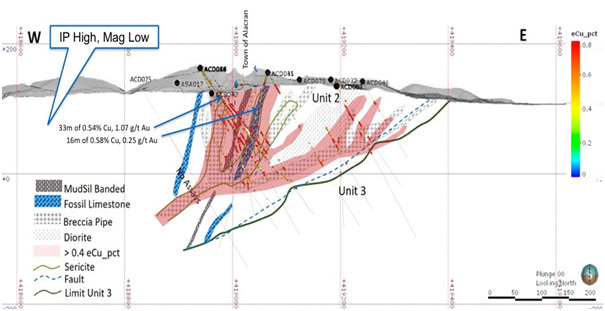 Figure 6: Internal metal zoning within the Alacran Deposit showing an increase in copper, silver, zinc and sulphur values to the north. Further north, beyond the limit of existing Alacran drilling, surface soil samples (Reflex ioGAS evaluated) have defined a 2.5 x 3 km area comprising anomalous copper, silver, zinc and sulphur values. Within this area, a single outcrop sample of breccia with aphanitic porphyry fragments contains disseminated and fracture-controlled chalcopyrite, which demonstrates that copper mineralization is present in the area. At a distance of 2 km northeast of Alacran at the Montiel East and West showings, artisanal mining has exposed copper porphyry style mineralization, alteration and quartz veining over a 1.4 x 0.7 km area. Copper-gold mineralization dips shallowly to the west as defined by quartz veining and is cut-off at depth. Combined pyrite-chalcopyrite-magnetite veining, structure and ground magnetics suggest a west-northwest direction to the mineralization. Importantly, the soil anomaly north of Alacran is 1 km west of the Montiel showings and suggests an intersection of the two structural trends at that location named the “Way Out West” anomaly. Ongoing work comprises a two-part program. BLEG stream sediment sampling and deep soil sampling into saprolite over bedrock is being conducted at the “Way Out West” anomaly to define drill targets. Re-logging of Alacran drill core is being done to outline breccia bodies, dikes and structures to guide continued exploration for a deep porphyry centre to the west. 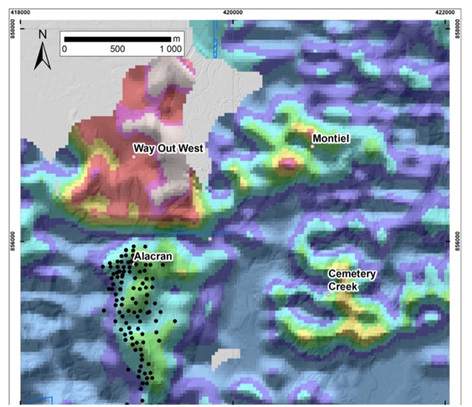 Figure 7: Significant historical silver soil anomaly north of Alacran and west of Montiel. Figure 8: Exploration vectors intersect at the “Way Out West” anomaly. The technical information in this release has been reviewed and verified by Dale A. Sketchley, M.Sc., P.Geo., a Qualified Person for the purpose of National Instrument 43-101. Mr. Sketchley is a consultant to Cordoba Minerals and is considered independent under National Instrument 43-101. Mr. Sketchley is a geologist with over 40 years in the mineral exploration, mining and consulting industry. He is a Member of the Association of Professional Engineers and Geoscientists of British Columbia (APEGBC) and the Canadian Institute of Mining and Metallurgy (CIMM). This news release includes “forward-looking statements” and “forward-looking information” within the meaning of Canadian securities legislation. 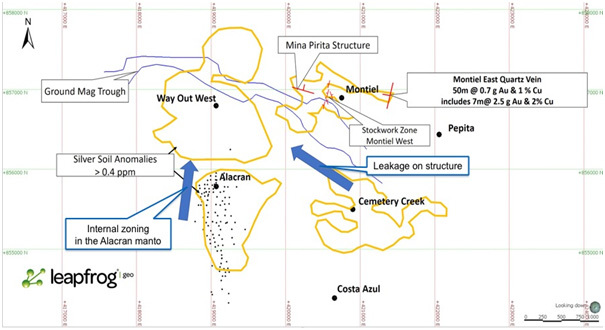 All statements included in this news release, other than statements of historical fact, are forward-looking statements including, without limitation, (i) that a detailed exploration review could identify the new mineralized targets at Alacran; (ii) that an area located to the west of Alacran and at the “Way Out West” anomaly could represent potential sources of mineralizing fluids in the San Matias District; and (iii) that geological fieldwork may lead to new or large-scale discovery within the San Matias District. Forward-looking statements include predictions, projections and forecasts and are often, but not always, identified by the use of words such as "anticipate", "believe", "plan", "estimate", "expect", "potential", "target", "budget" and "intend" and statements that an event or result "may", "will", "should", "could" or "might" occur or be achieved and other similar expressions and includes the negatives thereof. Forward-looking statements are based on a number of assumptions and estimates that, while considered reasonable by management based on the business and markets in which Cordoba operates, are inherently subject to significant operational, economic, and competitive uncertainties, risks and contingencies. There can be no assurance that such statements will prove to be accurate and actual results, and future events could differ materially from those anticipated in such statements. Important factors that could cause actual results to differ materially from the Company's expectations include actual exploration results, interpretation of metallurgical characteristics of the mineralization, changes in project parameters as plans continue to be refined, future commodity prices, availability of capital and financing on acceptable terms, general economic, market or business conditions, uninsured risks, regulatory changes, delays or inability to receive required approvals, and other exploration or other risks detailed herein and from time to time in the filings made by the Company with securities regulators, including those described under the heading “Risks and Uncertainties” in the Company’s most recently filed MD&A. The Company does not undertake to update or revise any forward-looking statements, except in accordance with applicable law.